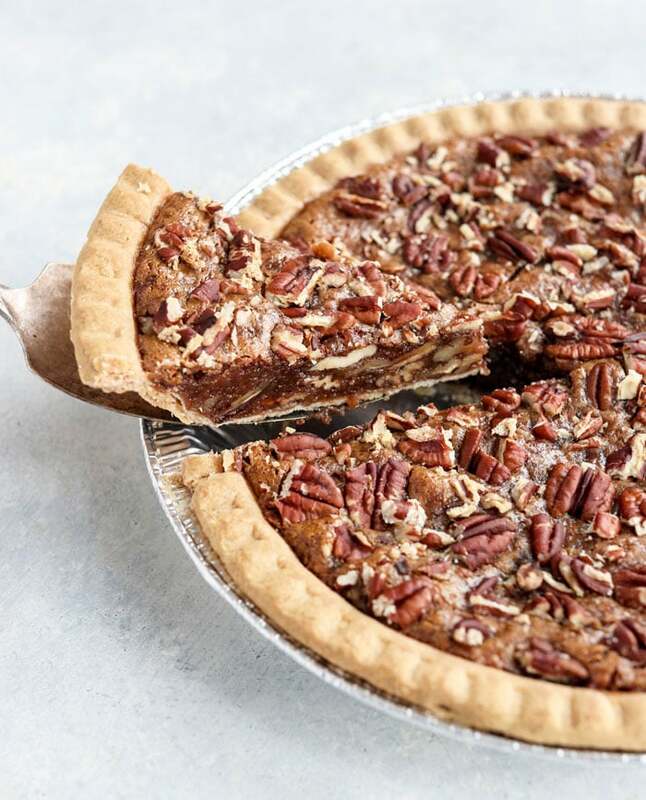 This Vegan Pecan Pie tastes remarkably similar to the kind my grandma used to make, but this one is naturally sweetened without using corn syrup. I’m amazed by how well the filling sets, without using eggs! I wanted this pie to be as healthy as possible, without sacrificing the taste or texture. I included dates in the filling, to help add some structure and natural sweetness, but I also used a little maple syrup to boost the flavor. Adding the liquid sweetener helps to “loosen up” the filling so that it doesn’t have the texture of a date ball. To make this pecan pie egg-free, I added 2 tablespoons of ground flax seed to act as a binder. I find that if I use more than that in any given recipe, I can start to taste the flax seeds, but I can’t taste them at all in this recipe, and neither could my taste testers. Grinding some extra pecans into the filling also helps with the binding, and provides extra pecan flavor! With a simple 5-ingredient filling, this recipe is just about as easy as it gets. All you need is a blender or food processor to blend it together. I prefer using the food processor so I can make my crust in it first, and then make the filling in the same bowl. There’s only one dish to clean that way! If you’d like to make a pie crust from scratch, I’ll be sharing a gluten-free pie crust soon. (There’s already a recipe in No Excuses Detox if you have that!) You can use any other unbaked pie crust that you love, too. I tested this recipe so many times because I couldn’t decide how many dates was the “perfect” amount for this pie. I landed on the recipe below, which uses a 1:1 ratio of dates to maple syrup. I also tested this recipe using only 1/2 cup of dates + 1 cup of maple syrup, and enjoyed the results– but my testers thought the flavor wasn’t quite as authentic, since the maple flavor was a little heavier. I share this just in case you’re short on dates for this recipe and want to try it that way instead! 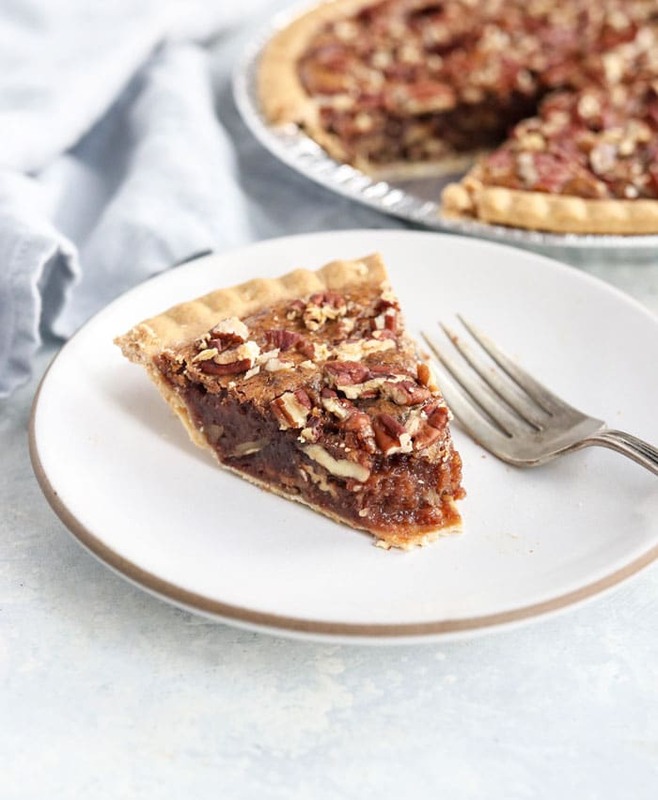 This easy Vegan Pecan Pie is naturally sweetened and has a remarkably similar taste and texture to the original, without using eggs or corn syrup! 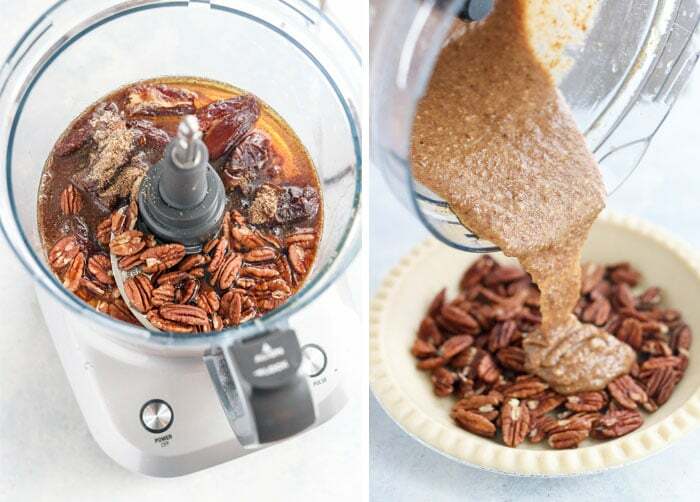 In a food processor fitted with an "S" blade (or in a high speed blender), combine the dates, maple syrup, flax seeds, 1/2 cup of the pecans, and the salt. Process until the dates are broken down and you have a relatively smooth batter. Pour 3/4 cup of the pecan halves into the pie crust and spread them out evenly. Pour the batter over the pecans and use a spatula to smooth it evenly. Top the pecan pie filling with the remaining 1/4 cup of pecans-- I like to crush them between my fingers and sprinkle them over the top so that the little pieces are evenly distributed. Place the pie in the oven to bake at 350ºF for 45 minutes. When it's done baking the top should look drier and the edges of the filling will be firm to a light touch. Allow the pie to cool completely, for at least 2 hours. You can put it in the fridge to speed the process, if you'd like to. 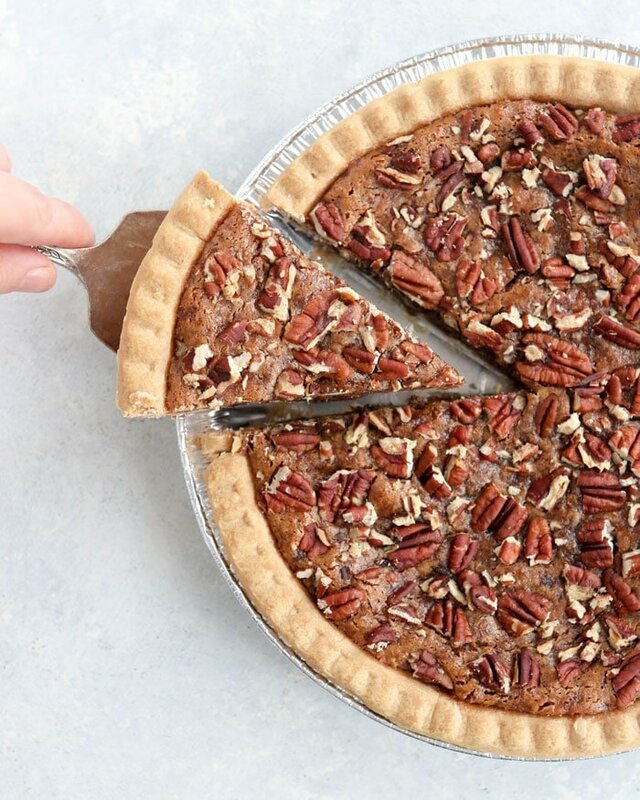 Slice the pie and serve chilled or at room temperature. Leftover pie should be covered and can be stored on the counter for up to 3 days, or in the fridge for up to a week. If you’re trying to watch your sugar intake, I’m guessing a sugar-free maple syrup would probably work as a swap for the real kind. I don’t use zero-calorie sweeteners myself, so please leave a comment below if you give this a try! As I mentioned above, this recipe also worked with 1/2 cup of dates (4 ounces) + 1 cup of maple syrup, if you’d like to go that route. You can use less maple syrup for a less-sweet pie, if you prefer. I was trying to get it as close to the real thing as possible! You can also add a splash of vanilla extract, if you like. I tried 1/2 teaspoon and 1 teaspoon in several test batches and felt that the vanilla flavor was overwhelming, so I prefer it without. As always, if you try something different with this recipe, please leave a comment below to let us know how it worked for you. We can all benefit from your experience! Reader Feedback: What’s your favorite holiday pie? 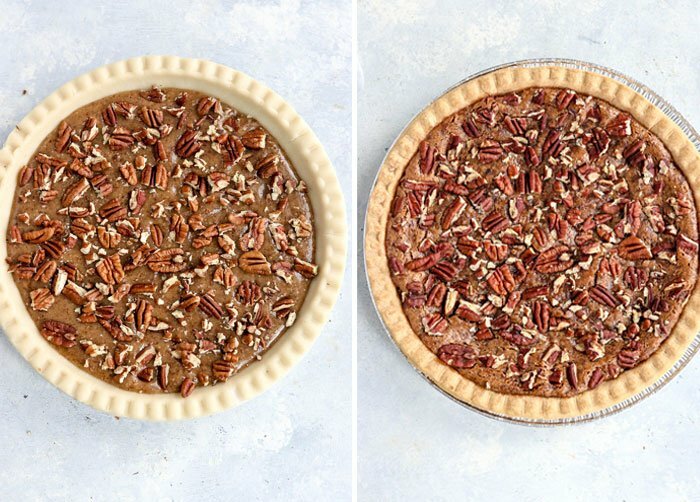 I think mine is still French Silk Pie, but my strawberry cream pie and this pecan pie are not far behind! Hi, made this yesterday with Walden Farms pancake syrup (real maple flavor but no sugar) and sucralose and it came out great! Since sucralose is dry compared to dates, I added an additional 2-3 tbsp of water. I always like vanilla so I included 1/2 tsp of vanilla extract as well. Thank you for this simple recipe. I like to limit my refined fats as well, so I appreciate that there’s no ‘butter’. No, it’s not gooey like traditional pecan pie, but honestly that was what I liked least about it anyway, so I don’t mind that this is not like that. Hi Meghan! I don’t know if this helps, but if you heat up the maple syrup to 235 degrees, it will mimick the texture of the corn syrup is supposed to impart on pecan pie. Great recipe! 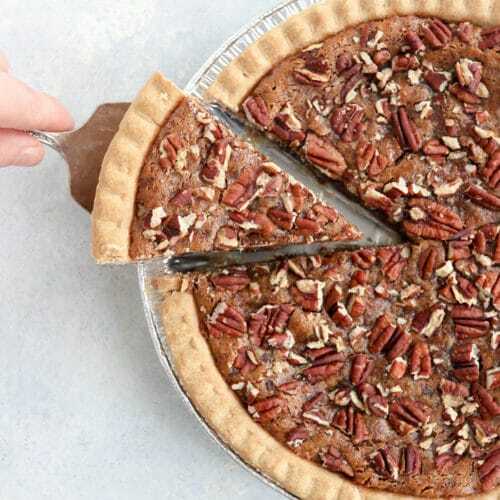 It has been decades since I’ve eaten a pecan pie for not eating eggs. My wife and I enjoyed this version very much. 2) I warmed the maple syrup and soaked the pitted dates in it overnight. 3) I took more like 2/3 cup of pecan pieces to cover the top of the pie to my liking. Which is basically completely covered. No loose pecans. All were stuck nicely to the blended filling. i useed a Vitamix, but have lost my stomper so it took a lot of turning on and off and manually stirring. With the stomper, this filling would have been a breeze in the Vitamix. This filled a commercial 9″ gluten free pie crust. So a bit on the shallow side compared to a glass pie dish. I’m excited to try this recipe in tart size. Can this filling be made in the Vitamix or does it have to be a food processor? Yes, you can make this one in a Vitamix! I made this for Thanksgiving 2018. Turned out amazing! Thank you so much for sharing this recipe! For those of us on special diets due to allergies, I find vegan recipes are so helpful! So thank you from a person who has very limited food preferences. You made my Thanksgiving special!! Pecan pie has always been my favorite Thanksgiving dessert. I have missed it every year since I became vegan. I baked it today and couldn’t wait until tomorrow (Thanksgiving) to taste it. Fantastic!!!! thank you thank you thank you!!!!! I love this pecan pie! Thanks for the recipe! This looks so delicious! Can I substitue flax seeds with regular eggs? Possibly, but I haven’t tested that so I can’t say for sure! Please let us know if you give that a shot! So I made this yesterday with two large eggs insetead of flaxseeds. It turned out delicisous! Everyone in my family loved them! Thank you! Wow Megan, this is definitely going on my Thanksgiving meal plan! My husband absolutely loved it, thank you so much! I just made this today!! Amazing! Full of flavor for so little ingredients! I had a premade crust so I doubled the filling. I’m glad you already tried it and loved it! Thank you for letting me know!